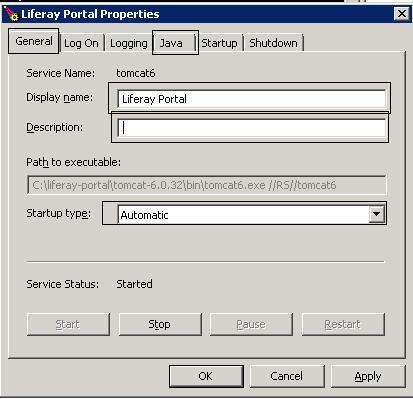 It is a very common scenario wherein, when you deploy liferay on Windows environment , you need to run tomcat as windows service. In this blog, i will list the steps to run tomcat as windows service. LIFERAY_HOME is reffered as location where liferay bundle in unzipped. Copy the folder JAVA_HOME/jre/bin/server, rename the new copy of the folder as jre/bin/client. 2)Download tomcat 64 bit installables. In my case i am doing for Liferay 6EE SP2 which comes with tomcat 6.0.32 so I downloaded following version of 64 bit tomcat. Please take back up of above files in LIFRAY_HOME\tomcat\bin if they already exist. g)Set Initial Memory Pool, Maximum Memory Pool. In case of any doubt, feel free to shoot me any questions through comment box. This entry was posted in Liferay, Liferay 61 and tagged Liferay, Liferay6, tomcat, windows service. Bookmark the permalink. Hi, I have 2 tomcat 6, how to install 2 tomcat6 in one computer?. Please help me! You can run them on separate ports and install as separate services. I am getting following error while starting the server. Windows could not start the Apache Tomcat tomcat6 on Local Computer. For more information, review the System Event Log. If this is a non-Microsoft service, contact the service vendor, and refer to service-specific error code 0. Hi Arvind, I’m able to install Liferay with Bundled Tomcat. And I found here (http://www.liferay.com/documentation/liferay-portal/6.1/user-guide/-/ai/installing-liferay-on-an-existing-application-server) the instructions to install Liferay if there’s already a Tomcat Server available and you need to refer it. There’s just a little detail I do not understand (I leave you the pleasure to understand how much is little this detail). At the end of thw procedure, it asks me to launch Tomcat by running startup.bat. My case is different. I have already a version of Tomcat installed on my server, which is configured to run as a service (and my boss tells me this couldbe a tipical situation if I’ll need to install Liferay on something like a Server Farm). So my questions is: could you suggest me what changes in the procedure suggested in the link specified above, if my tomcat server is already configured to be launches as a service? Another question: is Liferay EE necessary for this kind of work or could I keep on using Liferay CE? Thanks for your reply and for the time you’ll spend reading this message. I followed the same steps for installing liferay as a service in Windows 7. But after starting service from services.msc when i hit the liferay URL I am not getting home page, and the page is going into infinite wait loop. 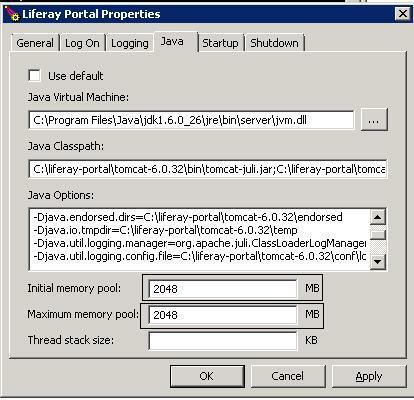 If you disable the service and run the liferay, do you still get infinite loop or not. Could you please check you liferay.logs and catalina.logs to see, if there is any error. but with small issue, for which i didn’t found reason. Setting initial memory pool and maximum memory pool to 1024.
and initial memory pool at 512 and maximum memory pool to 1024. Very good article, this “tomcat6w.exe ES tomcat6” saved me a time ) Thanks!